This is a scalable context timeline. 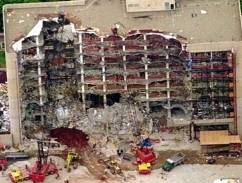 It contains events related to the event April 25, 1997: First Day of Testimony in Oklahoma City Bombing Trial Features Blast Survivors. You can narrow or broaden the context of this timeline by adjusting the zoom level. The lower the scale, the more relevant the items on average will be, while the higher the scale, the less relevant the items, on average, will be. Second Novel - Ten years later, Pierce will publish a second novel, Hunter, which depicts a lone assassin targeting Jews and African-Americans. Both this book and a reprint of The Turner Diaries will be released by a publishing house affiliated with the National Alliance, the National Vanguard Press (see 1988). Opening statements are presented in the trial of accused Oklahoma City bomber Timothy McVeigh (see 8:35 a.m. - 9:02 a.m. April 19, 1995 and August 10, 1995). Prosecution: McVeigh a Cold, Calculating Terrorist - Lead prosecutor Joseph Hartzler begins with an emotional evocation of the bombing and the story of one of the victims, Tevin Garrett, a 16-month-old child who cried when his mother Helena Garrett left him at the Murrah Building’s day care center. The mothers could wave at their children through the day care’s glass windows, Hartzler says. “It was almost as if you could reach up and touch the children. None of those parents ever touched their children again while they were alive.” He says of Tevin Garrett’s mother, “She remembers this morning [the morning of the bombing] because it was the last morning of [Tevin’s] life” (see 9:02 a.m. - 10:35 a.m. April 19, 1995). Hartzler wastes little time in slamming McVeigh as a “twisted,” calculating terrorist who murdered 168 people in the hope of starting a mass uprising against the US government. McVeigh, Hartzler says, “chose to take their innocent lives to serve his own twisted purposes.… In plain and simple terms, it was an act of terror and violence, intended to serve a selfish political purpose. The man who committed this act is sitting in this courtroom behind me. He is the one who committed those murders.” Hartzler says that McVeigh blew up a federal building in Oklahoma City to avenge the federal assault on the Branch Davidian religious compound outside Waco, Texas (see April 19, 1993, April 19, 1993 and After, and April 24, 1995). “Across the street, the Ryder truck was there to resolve a grievance,” Hartzler says. “The truck was there to impose the will of Timothy McVeigh on the rest of America and to do so by premeditated violence and terror, by murdering innocent men, women, and children, in hopes of seeing blood flow in the streets of America.” He notes that McVeigh carried an excerpt from the violently racist novel The Turner Diaries (see 1978) that depicts the bombing of FBI headquarters in Washington. Hartzler reads the following line from the excerpt: “The real value of our attack lies in the psychological impact, not in the immediate casualties.” Hartzler also notes the T-shirt McVeigh wore when he was arrested, a shirt that Hartzler says “broadcast his intentions.” On the front was a likeness of Abraham Lincoln and on the back a quote from Thomas Jefferson: “The tree of liberty must be refreshed from time to time with the blood of patriots and tyrants.” Drops of scarlet blood dripped from a picture of a tree. Investigators found traces of residue on McVeigh’s shirt, in his pants pockets, and on a set of earplugs found in his pocket (see Early May 1995 and After). Hartzler reads from a document McVeigh had written on a computer belonging to his sister, Jennifer (see November 1994). In a letter addressed to the Bureau of Alcohol, Tobacco and Firearms, McVeigh wrote: “All you tyrannical [expletive], you’ll swing in the wind one day for your treasonous attacks against the Constitution of the United States.… Die, you spineless, cowardice [sic] b_stards” (see May 5-6, 1997). Hartzler says the trial has nothing to do with McVeigh’s beliefs or his freedoms of expression: “We aren’t prosecuting him because we don’t like his thoughts. We’re prosecuting him because his hatred boiled into violence.” Of the innocent victims, Hartzler tells the jury that McVeigh “compared them to the storm troopers in [the popular science fiction movie] Star Wars (see October 21 or 22, 1994). Even if they are innocent, they work for an evil system and have to be killed.” Hartzler moves to preempt expected defense attacks on the prosecution’s star witness, Michael Fortier (see After May 6, 1995, May 19, 1995 and August 8, 1995), on reports that evidence was mishandled by an FBI crime lab (see January 27, 1997), and the failure to identify or apprehend the now-infamous “John Doe No. 2” (see June 14, 1995). Hartzler concludes: “Timothy McVeigh liked to consider himself a patriot, as someone who could start a second American revolution. Ladies and gentlemen, statements from our forefathers can never be twisted to justify warfare against women and children. Our forefathers didn’t fight British women and children. They fought other soldiers, they fought them face to face, hand to hand. They didn’t plant bombs and then run away wearing earplugs” (see Early May 1995 and After) Hartzler returns to the prosecutors’ table; Matsch calls a brief recess.